As part of an advance benefit screening of Gus Van Sant's Paranoid Park for the San Francisco Film Society (the film will be showing up in American cinemas shortly after Christmas), Andrew Bailey—author of the recently-published Taschen volume Cinema Now—introduced Gus Van Sant who he feels is championing arthouse cinema at a time when arthouse cinema is having such a difficult time in the United States. Van Sant—though originally not scheduled to be at the benefit screening—happened to be in San Francisco casting for his next feature Milk and agreed to present Paranoid Park for the benefit screening. The film is based on a novel by Blake Nelson, and takes place in Portland, Oregon. The story revolves around a teenage skateboarder who accidentally kills a security guard. It premiered at the 2007 Cannes Film Festival as one of the 22 films in competition, and won the extra-special 60th anniversary prize. Van Sant mentioned that—because the Letterman Digital Center is one of the few places equipped to do so—Paranoid Park was going to be projected in its original aspect ratio, 1.37—"so it's a big square." He explained that he's been shooting his last few movies in this format, partly because they were commissioned as HBO television projects, allowing for the square format. Likewise, when he was a film student in school, he used to shoot in 16mm so he's continued to do so. Though 1.37 is Paranoid Park's original aspect/ratio, it's sometimes shown in different formats due to the limitations of in-house projection systems. When it comes out in theaters it will most likely be shown in 1.66 or 1.85. The rare opportunity to screen in the Letterman Digital Center allows the film to be projected as it was meant to be seen. Andrew offered the keen insight regarding using aspect ratio as character development, with which Van Sant fully concurred. The casting for Paranoid Park was all local Portland kids, a similar process to the casting for Milk in San Francisco with local characters. Paranoid Park is sinuously photographed by Christopher Doyle who haunts the skateboard trajectories with his attentive camera, capturing their "grace and havoc." The film's visuals are reinforced by a remarkable score, which I felt compelled to ask Van Sant about. Michael Guillén: You've assembled an evocative, eclectic score for Paranoid Park. The sound design for this movie is brilliant. Could you speak a little bit about that and specifically your usage of Nino Rota to imply the subjectivity of the protagonist? Gus Van Sant: A lot of times when [you're] working with the sound, you choose things that you know, recordings that you have, things that occur to you, or something you've just heard on the radio. A lot of times, early on, it was things that I was listening to on the radio. On Drugstore Cowboy there were songs that I would hear on the radio driving to the set. On Good Will Hunting there was an Elliot Smith record that I had that I would listen to and, y'know, you just latch onto it. At this point I'm working on a Mac and you have iTunes on the Mac. As you're working, you can click on iTunes and weigh things. Sometimes I was working and the score was going along at the same time because Eric Hill, who's my assistant editor, is a musicologist and he has a lot of stuff in his iTunes. He would leave it on because he was listening to it while seeing dailies or whatever and so I would hear things that I would ordinarily not hear. I would make associations and/or drag the song into the score haphazardly but also instinctive discovery. Nino Rota was stuff I had at home. That was stuff I brought from home. We were putting Nino Rota to the images and also the scenes. I think we were always intending to replace them because we assumed Nino Rota's estate wouldn't allow it. We did try to recreate it a couple of times and we realized that the musicianship of those old recordings is sort of impossible now because, y'know, early '60s to mid '60s the musicians in Italy at the time they have a style that—no matter what you do—you can't get there from here because the musicians of today are just different. Techniques and also recording equipment are different. Even if you have the right mic and the right recorder, you don't do it the same way. So we got permission through Hal Wilmer of the Nino Rota estate to use [Rota's music]. It was really us trying to use the best thing that we had and at that time it was Nino Rota. We couldn't really replace it because we loved it. Great scoop for The Evening Class, Michael. Thanks for opening the dialogue about the music in the film. It's always interesting to read how creative decisions are reached. I only wish you had the opportunity to interview Van Sant further because there's plenty more I know you'd have teased out of him. I'm even more anxious to see the film now. Thanks! That's interesting about the aspect ratio. I'm almost positive it was projected at 1.37:1 in Toronto, although after binging on so many widescreen films that week, I may have mistaken 1.67:1 for the classic ratio. I really can't wait to see Paranoid Park again. Thanks for your comments guys. 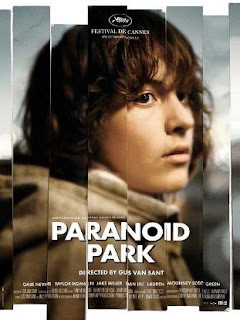 Larsen Associates, the publicists for Paranoid Park tell me they're working on securing me a one-on-one with Gus Van Sant. So keep your fingers crossed!